[by Hwang Ji Hye /translated by Kim Young Shin] Lamy Cosmetics was named as the Global Best Cosmetics Leader at ‘2016 Asia Beauty Awards in Shanghai’. The company is a global cosmetic brand that produces safe and high-quality beauty products like Real 97% Rice Paper Eating Mask Pack, better known as rice pack. Its subsidiaries such as CATALINA GEO, LAFINE VEGETABLE, CATALINA Coregen, LAMIETTE, dr. GEO and atobebe satisfy the beauty consumers worldwide with numerous products. Lamy Cosmetics is recognized as the brand that promotes the excellent quality of Korean beauty products overseas. Its superior products are sold in 20 countries including the United States, China and Vietnam. 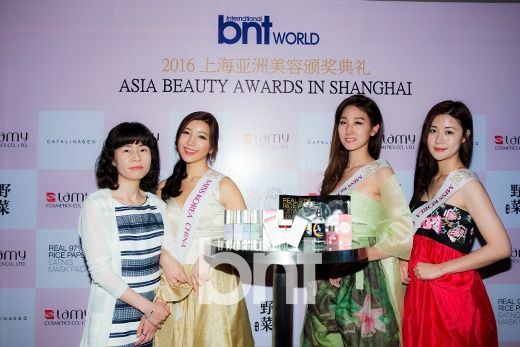 Meanwhile, ‘2016 Asia Beauty Awards in Shanghai’ was held at Renaissance Shanghai Chaohejing Hotel in Shanghai China on May 19. The event was hosted by Phoenix New Media and bntworld and arranged by Asian Center Commission, Miss First International and Shanghai IDEA. At the ceremony, several prominent global brands were rewarded for their international performance and relatively unknown companies were recognized. Excellent products that would lead the future of Asian beauty trend were also selected during the event. Asia Beauty Awards aims to establish a standard to evaluate Korean beauty brands to help consumers to wisely choose their cosmetic products.